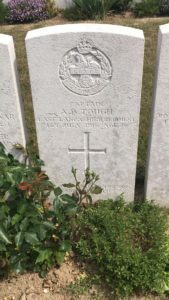 To mark the centenary of the end of the First World War, 27 Y10 students departed on a three day Battlefields Tour from Monday 2nd – Wednesday 4th July with staff from the History Department. Arriving at school for 3.30am in the morning, students began the journey by coach down to Dover to board the ferry across to Calais. On the way we pulled into pick up our Battlefields Tour Guide, Tim Stoneman, who would support the group throughout the trip and provide detailed historical knowledge to give context and meaning to each site that we visited. 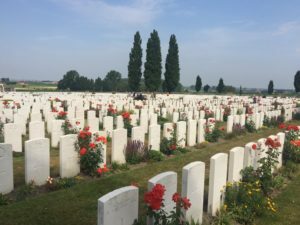 Over the three days, students and staff explored the battlefields around the Somme in Northern France – an area that was particularly significant for our students as so many soldiers from the South Yorkshire region died during that battle. Also we were involved with the Last Post Ceremony at the Menin Gate in Ypres – a remembrance ceremony that takes place each and every night at 8pm to remember those that have sacrificed their lives in the pursuit of peace. Alongside our historical tour, students were also able to explore the historic town of Ypres, eating in two different restaurants, getting some great deals in a local chocolatier and enjoying an evening of bowling. Our students wrote down at the end of the trip their thoughts and feelings about what they had observed and been part of. Students summarised their feelings into the following words. Thank you to all the students who came on the trip and represented Hall Cross Academy incredibly well. A big thanks also to Mrs Wilkinson, Miss Hyndman and Mrs Lloyd who accompanied Mr Lane on the trip. Also it was great to work with our tour company, Equity, Tour Guide, Tim, and Coach Driver, Ronnie!